Positive psychology research can be applied much more powerfully with hypnotherapy than with normal "talking therapy." Since 1998 Fredrickson has researched how positive emotions play a vital role in developing personal resources which enable people to experience greater life satisfaction and resilience. Interestingly, research by Fredrickson and others published in 2008 showed how loving-kindness meditation practice produced increases over time in daily experiences of positive emotions, resulting in increases in a wide range of personal resources (e.g., increased mindfulness, purpose in life, social support,) and decreased illness symptoms including depressive symptoms. Guided loving-kindness meditations and other approaches to increase positive emotions can be part of wellbeing and performance interventions with clients and in some cases adapted to career coaching and staff performance contexts. Traditional loving-kindness meditations can be reinforced with insights and techniques from hypnotherapy, such as post-hypnotic suggestions to strengthen positive emotions. From his earlier work on learned helplessness Seligman went on to research “learned optimism”. In 1998 he published a book by that name. Learned optimism differs from positive thinking in that it is NOT merely thinking positive thoughts such as “I’m getting better/richer/happier every day.” Learned optimism is a set of cognitive skills which enable reframing of personal events in relation to their permanence, pervasiveness, and personalisation. However, it is important, particularly in situations where the potential downside is large, that it doesn’t become delusional optimism. Despite this risk, on an everyday basis it is more common that an individual’s wellbeing and performance is undermined by delusional (or excessive) pessimism and hence the frequent applicability of this theory. Once again, as with Broaden and Build Theory, what we need is a flexible, appropriate balance. A positive psychology exercise related to Learned Optimism is to write down and reflect on three good things that happened each day. This exercise achieved significant six-month beneficial effects from a one-week practice when tested with a large group of participants according to Seligman and others (2005). Focused awareness interventions (mindfulness and hypnosis) can be used to intensify awareness of “good things” and reinforce cognitive shifts on permanence, pervasiveness, and personalisation of personal events. Csikszentmihalyi has been researching the human experience of “flow” since the 70’s and is recognised as the leading expert in this area of psychology. Flow is a state of awareness where one is completely absorbed in an activity. Hypnosis is a type of flow experience. The key condition for flow is that there is balance between the experienced challenge of the situation and one’s experienced capacity to meet those challenges. The greater the personal challenge and capacity the more the experience of flow tends to complete absorption. Clear, intrinsically motivated goals and immediate feedback assist in creating the experience. Research shows that flow experiences (including hypnosis) can stimulate a positive, upward spiral in wellbeing and performance as show below. 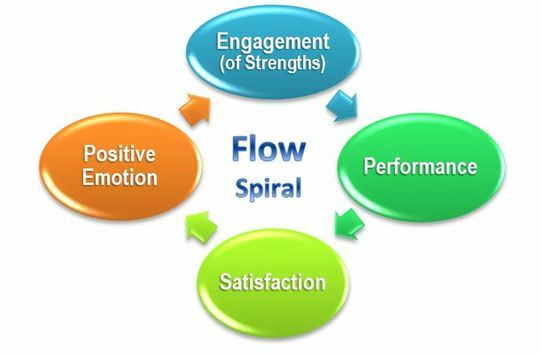 In flow, we tend to more effectively engage our strengths, resulting in improved performance, which in turn can fuel satisfaction and positive emotions which support even more engagement. It is widely recognised that there are similarities between flow and states of mind achieved by meditative practices in Eastern religions such as Buddhism, Taoism and Hinduism as well as in contemplative practices in from the West. More specifically Pritikin (2012) suggests that, “thoughtless awareness”, one of the ultimate destinations of meditation may be an essential element of flow. One application of flow in wellbeing and performance interventions is to connect the client to memories of flow experiences to deepen their awareness of the phenomena and strengthen their ability to access this state of mind. Strengths and flow are closely linked. One way to spot strengths is to identify what one is doing when in states of flow. The identification and development of personal strengths is a core aspect of positive psychology. Donald Clifton first started researching human strengths in the 1960s and was recognised as the “Father of Strengths Psychology” by the American Psychological Association. In association with Marcus Buckingham and Tom Rath, he released the Clifton Strengthsfinder in 2001 which identifies 34 potential key strengths primarily from a competence perspective. In 2004, Christopher Peterson and Martin Seligman published the Character Strengths and Virtues handbook and this was later presented as an assessment called the VIA (Values in Action) Survey of Character Strengths. It’s focus is more fundamental, on character and virtue, although there is some overlap with what is assessed by Strengthsfinder. Peterson and Seligman’s work on character strengths has been influential in shifting psychology’s focus to include what is right with people and not just what is wrong with them. This data is then used to categorise and rank the 60 attributes showing whether they are realised strengths, unrealised strengths, learned behaviours or weaknesses. In 2011, another approach to strength assessment and development appeared with the release of the StandOut system from Buckingham. It identifies nine different common clusters of talents, detects the rank order and then provides a development process and other input for optimising the top two talent clusters of an individual. It is particularly focused on leadership and team development. All of these tools have their own relative advantages and disadvantages. Together with the research behind them, they have greatly progressed the application of strengths-based psychology since the 1990s. With, or without the above quantitative tools to define strengths, individuals can be helped to recognise and connect to their strengths. Qualitative strength exercises have their own advantages. The surprising power of the Pygmalion effect was first identified by Robert Rosenthal and Lenore Jacobson in their study of school children published in 1966. Students identified to their teachers as “intellectual bloomers” did better. Unknown to the teachers was that the bloomers were chosen randomly. Since 1998 the Pygmalion effect has been integrated into positive psychology. A meta-analysis (that combined the results of multiple studies) by Avolio and others (2005) found that leadership training focusing on the Pygmalion effect was the most effective leadership intervention. This highlight the importance of positive expectations when working with individuals and groups. These expectations can be facilitated by focusing on client strengths and using a learned optimism mindset. To improve the relationships of clients (a key wellbeing factor) interventions can encourage clients to apply the Pygmalion effect in their own relationships via suggestion strategies including a strengths focus on friends. The work of Dr Paul Wong focuses on the evidence for the crucial role of personal meaning in human wellbeing. Since the 1990s he has built on the work of Viktor Frankl and Logotherapy with prolific research and writing on topics such as Meaning Therapy and existential positive psychology. According to Wong (2012), for those who embrace a meaning-mindset, the good life lies in the heroic struggle to realize an ideal. Their life satisfaction is beyond pleasure and pain, and beyond success and failure. Purpose (the motivational component) – your calling, life goals, core values… knowing what really matters in your life… and using this to direct and fuel your life. Understanding (the cognitive component) – authentic, holistic self-knowledge (as opposed to the common practice of self-deception) and achieving a coherent, unblinkered understanding of your culture and world. Responsible action (the behavioural component) – doing what is right, including appropriate actions and reactions that are congruent with your highest values. Enjoyment/Evaluation (the affective component) – living the PURE way leads to a type of joy which is very different from the ultimately unsatisfying hedonic pleasure that is commonly pursued. Self-reflection, evaluation and self-correction are needed to empower the PURE process across your lifespan. The PURE model is an excellent personal foundation and guide for any practitioner of positive psychology. It also offers a specific framework for interventions focused on building meaning in clients’ lives. From her research in the areas of motivation, personality, and development over the last couple of decades, Stanford University Professor, Carol Dweck, discovered a simple but powerful idea: it is not ultimately our talents that bring us success – but whether we have a fixed or growth mindset. According to Dweck (2006), individuals can be placed on a continuum according to their deep beliefs of where achievement comes from. Some believe their success is based on innate ability; these are said to have a fixed mindset. Others, who believe their success is based on hard work, learning, training and doggedness are said to have a growth mindset. Fixed mindset individuals dread failure and try to avoid the appearance of it, because it is a deeply negative statement on their basic abilities and identity, while growth mindset individuals don't mind failure as much because they realize their performance can be improved and learning comes from failure. While on the surface switching to a growth mindset seems quite simple there is a tendency for fixed identities to resist as they are entrenched defensive mechanisms we have commonly relied on since childhood. Hence for many people (including myself) to achieve a deep growth mindset requires a process of inner resource building ideally focusing on all five areas of the PERMA model. 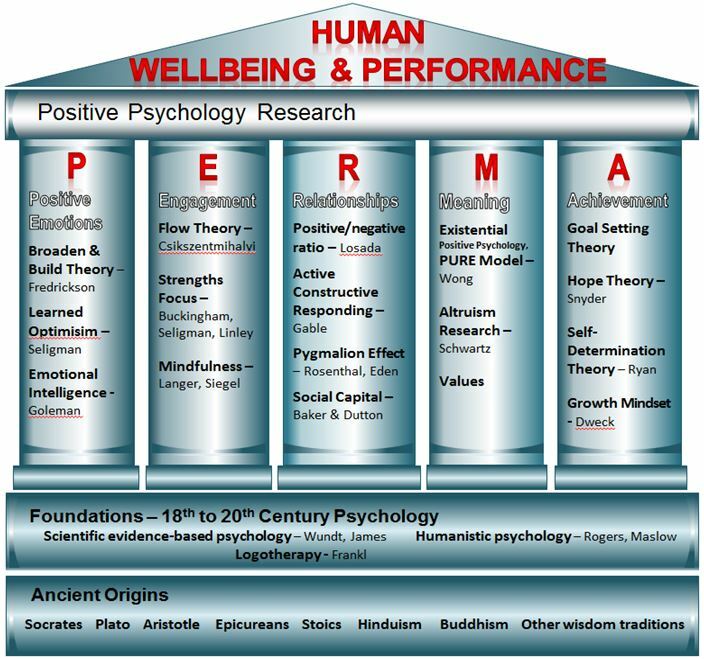 This exploration of positive psychology, its history, researchers, and key findings reveals numerous potentially fruitful opportunities for hybrid approaches integrating positive psychology, advanced training techniques, and hypnocoaching. Dweck, C. (2006). Mindset: The new psychology of success. Random House Digital, Inc..
Eden, D. (1988). Pygmalion, goal setting, and expectancy: Compatible ways to boost productivity. Academy of Management Review, 13(4), 639-652. Rathunde, K. (2000). Broadening and narrowing in the creative process: A commentary on Fredrickson's" Broaden-and-build" model. Prevention & Treatment 3 (1). Seligman, M. E. (1998). Learned optimism. Wong, P. T. (2012). Toward a dual-systems model of what makes life worth living. The human quest for meaning, 2. Yapko, M. D. (2011). Mindfulness and hypnosis: The power of suggestion to transform experience. WW Norton & Company.